A few weeks ago when doing some online shopping we came across what is now one of our favorite online stores for our little princesses. My Princess Closet is a fabulous collection of clothing, accessories, unique gift items and everything your special princess needs in her life. We just can't brag enough about the swell customer service, budget friendly shipping and fast delivery. The owner, Dawn, sent us a few things for review, and we fell in LOVE with them. First on the list is the exclusive award winning Hada the Hippo Zoobie! Not only is it a plush toy ($30) but it is a comfy blanket and soft pillow - all in one! Hada makes the perfect traveling companion for your princess! It is so super soft and cuddly and great at her keeping her entertained when she is awake but perfect for keeping her very comfortable while she gets her beauty sleep! Have a little one? BABY ZOOBIES ($25) are the perfect companion for the tiniest of princesses. Very similar to a full-size Zoobie, these little babies open to a pillow and then a blanket - a perfect place for your princess to nap. And just for babies, this blanket has a comfort corner for grabbing and teething. For those little ones who love to tote things - the Fancy Prancy Princess Goody Bags ($10) are the perfect stylish totes with tricot handles and velcro closure. Pick one out to match your princess' hair color and she will love carrying it around town. 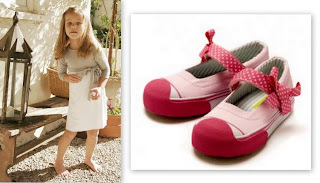 The perfect additions to your little fashionistas wardrobe are the Pinky Tessa by Morgan& Milo. The most popular Mary Jane in beautiful brushed twill has a delicate grosgrain bow, cushioned insole and protective rubber toe bumper - she won't want to take them off! And for a great price - on sale now at 40% off! - they are a little under $23! To go along with the shoes you may want to check out the oh so chic dresses, tops, skirts and pants - all on sale! We love the Ava Dress by Chase 'n Sky but hurry, limited sizes and styles are available. Get shopping NOW! We are sure The Princess Closet is a place you will surely LOVE to shop. Disclaimer: All items were Cupcake Mag tested and PRINCESS approved. We received items as samples for review so we could give you our opinion. This is the cutest store ever. I actually stopped reading to go shop and visit, don't worry I came back :) LOVE IT ! Need a Stocking Stuffer? We got the perfect gift!